Panasonic used this year's IFA to showcase its latest developments in 3D technology and made a bold claim that it would be "the first company to come to market with both a 3D TV and compatible Blu-ray player." The revelation was made by Yoshiiku Miyata, Panasonic Vice President, who also explained how Panny's 3D is the best around. With a sly dig of Sony's 3D LCD Bravia technology he mentioned that: "PDP is the best way to show 3D in the Full HD format. With LCD, images blur; with PDP images are crisp." Miyata also explained how Panasonic's 3D roots were already in Hollywood, saying that it was the "only manufacturer who has an R&D factory in Hollywood" and that Panasonic was "collaborating closely with Hollywood and leading the way in consumer 3D standards". Cue a little bit of Hollywood in Berlin, as Avatar producer Jon Landau took the stage to show his support for Panasonic's 3D technology. "Jim wrote Avatar before Titanic, but the time wasn't right for the technology," explained Landau. "What we tried to do was use CGI technology to create characters that were emotive and engaging. "Panasonic turned out to be the right choice, it just seemed to make sense when we talked about future cinema innovations." He finally remarked that: "Avatar will evolutionise, not revolutionise. 3D is not just about action movies. It is more engaging than that." 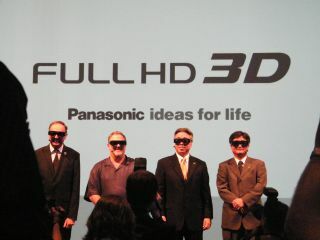 While Panasonic announced its attention to bring 3D to the home by 2010, no new products in this area were revealed. The demos that took place were with the company's 103-inch plasma – similar to what was shown off at CES in January.